This is an ideal system for hotels, restaurants, bars, pubs and nightclubs that want to make the most of porches, terraces or other open spaces throughout the whole year. 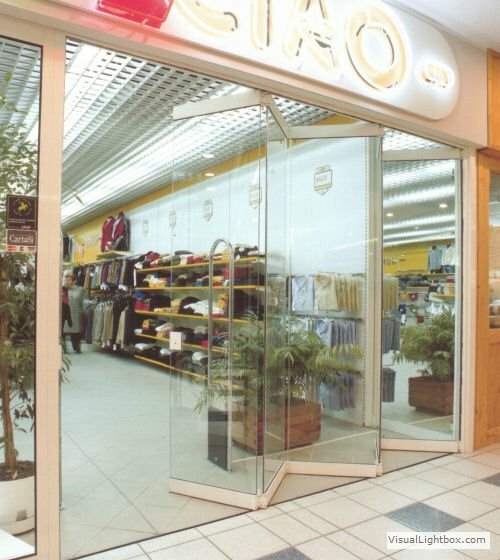 The system is especially popular with shops and shopping centres for use as display windows or shop fronts. It helps to make direct contact between the buyer and seller and breaks down the barrier between inside and outside. The manoeuvrable all glass, seamless Giemme system has minimum visual impact and is suitable for any type of architecture. 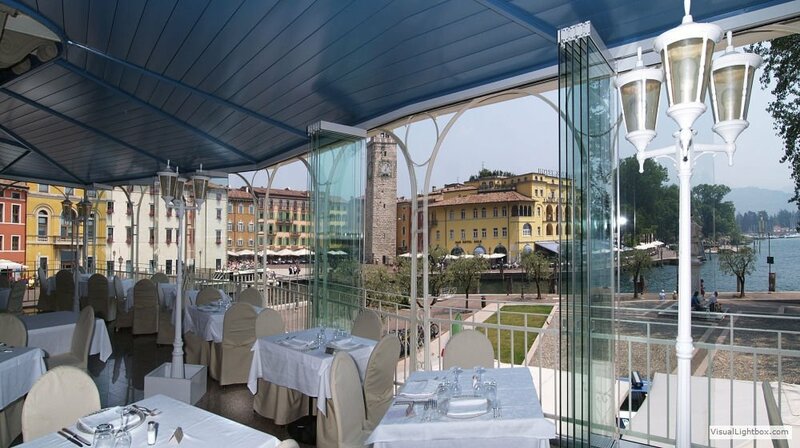 There are no limits to the possible width unlike traditional frames since it is a modular system and completely flexible. Even when the windows are closed one can enjoy an interrupted outside view from the inside and vice versa. This is thanks to the fact that there aren’t any frames between the individual panes of glass only a transparent polycarbonate seal which guarantees air tightness and protection against other atmospheric elements. Testing of GIEMME SYSTEM products ensures compliance with regulations UNI EN 14351-1that regulate the performance of windows and frames for the following characteristics: air permeability, water tightness and wind and impact resistance. When the doors are open the sudden onset of a summer storm is no longer a problem since handling operations (opening and closing) can be carried out easily by a single person. This is thanks to a practical, lightweight sliding system which doesn’t disturb the occupants of the premises in the slightest. The doors fold open to the side taking up only the most minimum room thus making spaces extremely flexible. The "all-glass" corner , without mounts, can be seen when the doors are closed and one can enjoy the angle free from obstruction when the doors are open. In addition, the special “curved-angle system”applied to corners, allows you to exceed angles of 90 degrees making it particularly useful in situations where you want to fold the doors up to one of the two sides, perhaps against a wall or other niche. Depending on the specific functional requirement, one of several available floor guide rails, will be recommended and in some cases, may not even be necessary. You can choose from an infinite range of aluminium finishes(anodized, lacquered, wood effect etc.) and for the glass, in addition to the traditional clear, you can opt for frosted, extra clear, stained glass or screen-printed. 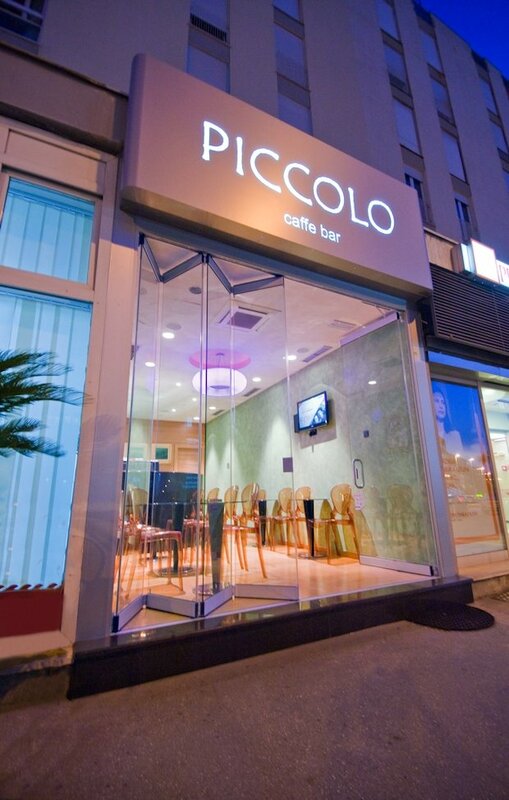 It’s also possible to make use of the glass as an advertising space by applying a semi-transparent film with perhaps a logo or other slogan of the business. The room can be changed or returned to normal by simply replacing or removing the film. Cleaning of the glass couldn’t be easier, even on the upper levels of the building, where thanks to new patented, detachable hinges, you can clean the outside of the building whilst remaining indoors and thus eliminating the need for scaffolding. Side stacked folding glass without an access door. It’s folded and stacked at the mounted side and even available without a floor guide rail, up to a maximum of four doors. It can be opened internally or externally. With access door (hinged swing), folded and stacked at the opposite side to the door. It’s stacked at the mounted side and even available without a floor guide rail up to a maximum of four doors. Door with closer, handle and lock. It can be opened internally or externally. With access door (hinged swing), folded and stacked at either side. With access door (hinged swing), folded and stacked at either side. The glass can be stacked at either the mounted side or the door side. Only available with recessed floor rail. Door with closer, handle and lock. It can be opened internally or externally. 3D is another solution for pubs and bars. . It has a fixed transom window (opening or flap). 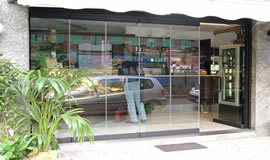 In this glass panel system there is a swing door with a handle and lock. 3D is a classic glass panel system without doors or handles.